When we were invited to accompany my father-in-law and his wife on a trip to Namibia, naturally, we jumped at the opportunity. We knew we were going to see a place that contrasted sharply from our home. But we wanted our children to come away with an appreciation for a people and way of life that few of us ever have the opportunity to experience. Because we had a desire to see more than the landscape and its wildlife, we reached out to Court Whelan, our contact at Wilderness Safaris, and asked if it would be possible to visit a school during our safari. 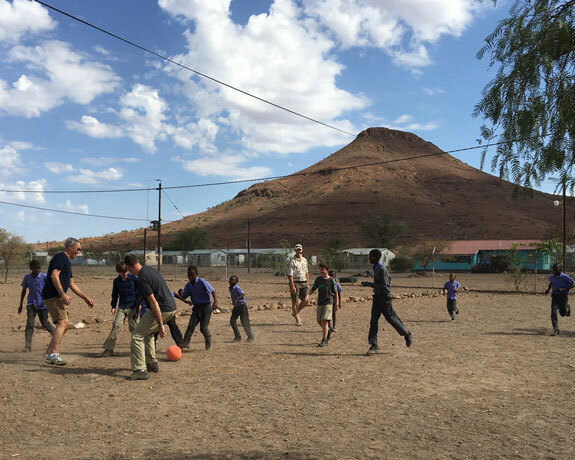 Adjustments were made and a visit to the Jacob Basson Combined School in the remote reaches of Damaraland, Namibia was arranged. The Jacob Basson Combined School (JBCS) was originally designed to serve 150 students. Today, it is a boarding school for 400 students from kindergarten through grade 12. 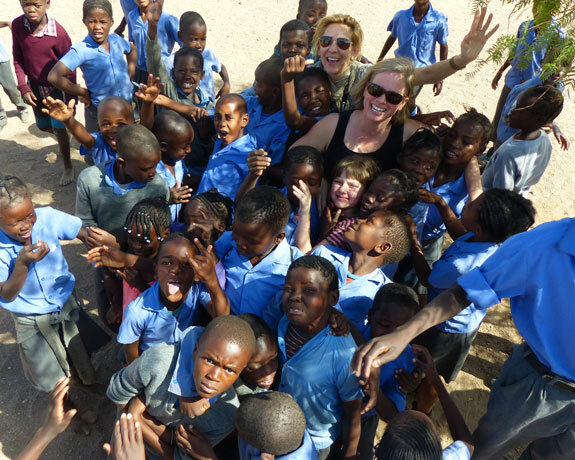 The school has a close relationship with Wilderness Safari’s Damaraland Camp. Thanks to this relationship, the school benefits from a partnership with Pack for a Purpose, enabling guests to drop off a handful of supplies when they visit the camp. We wanted our visit to be meaningful – not just for our children, but also for the students at the school we would be visiting. 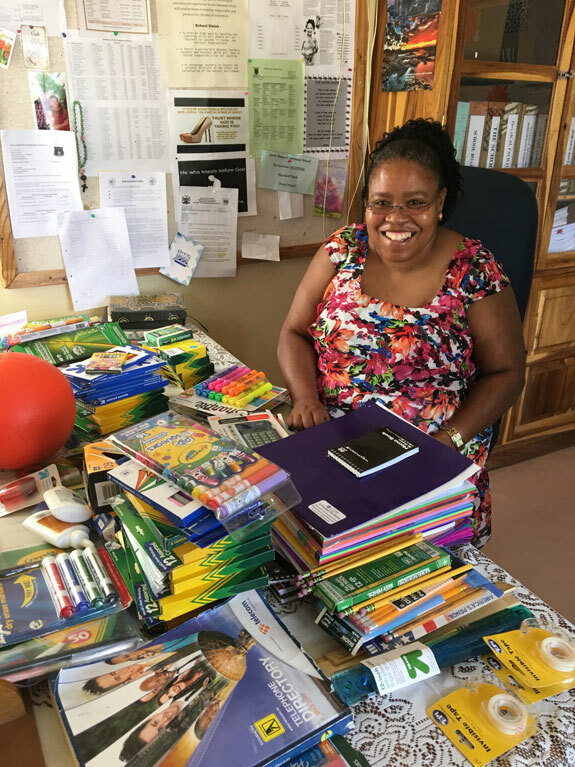 We reached out to our children’s teachers and asked if we could take up a collection of supplies in their classrooms and have the students write letters that we’d share with the students at JBCS. Our daughter’s 3rd grade teacher embraced the opportunity; her class filled a bin with supplies and wrote letters describing life in the U.S. With extra supplies from friends and family, we managed to fill not just the allotted duffle, but made room in each of our bags for close to 60lbs of pencils and pencil sharpeners, crayons, notebooks, calculators, rulers and pens. We even filled our water bottles with dozens of erasers. We also reached out to Opportunity Education Foundation, a nonprofit whose mission is to make quality education accessible to children in developing countries (founded and run by the Ricketts family). A couple of emails later, we added a portable hard drive complete with curricula for grades K-12 to the supplies. The school’s wish list of larger items included bookshelves and a high volume printer. About three weeks before our departure, we combined efforts with my in-laws and donated funds for the bookshelves. 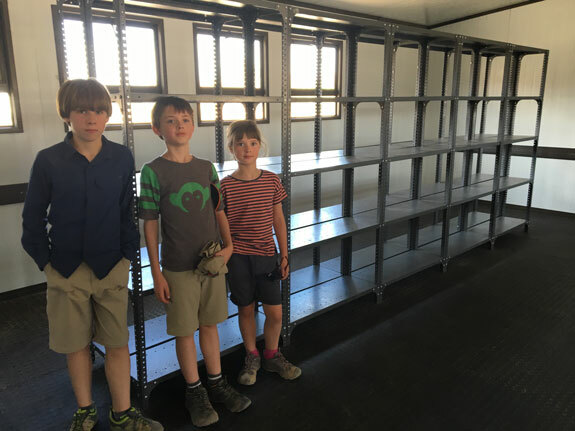 By the time we arrived at the school, the bookshelves had been delivered and assembled in the new library building. Thanks to the quick and inexpensive transportation of the shelves, we were able to give more with the purchase of a computer for the school. The 9th grade class welcomed us by singing traditional songs, including the Namibian National Anthem. We then visited the 3rd grade, where my daughter shared letters from her classmates. The students were initially wary of our presence, but as we proceeded to other classrooms, the excitement built. We quickly discovered that our cameras were the perfect ice-breaker. Most of the kids had never had their picture taken and loved seeing the instant pictures pop up on our digital screens. My daughter huddled in a corner with 5th graders sharing pictures from home of our dogs and chickens. My in-laws brought a soccer ball and, with the principal’s permission, a pickup soccer game ensued with our sons. Finally, we presented the principal with the supplies and hard drive and were given a tour of the school’s new library space with the bookshelves. The hours spent at the school were an incredible gift. Returning home, I started to go through pictures and shared some from our visit to the school on social media. The pictures were picked up by Wilderness Safaris on Twitter and caught the attention of Pack for a Purpose. 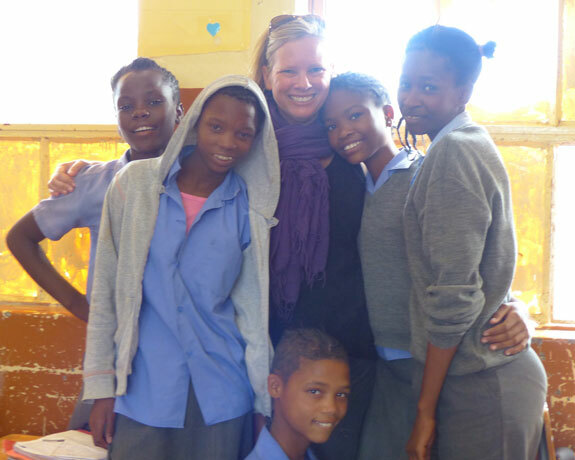 After a few emails and a phone call with Rebecca Rothney, Pack for a Purpose’s founder and chief cookie maker, we learned all about the work that the organization does with locations throughout the world, including Damaraland Camp. We certainly plan to use them for our future travels so that we can continue to make an impact as we show the world to our children – for we are never merely tourists in our travels, but have an opportunity to learn and share in order to make the world a better place.